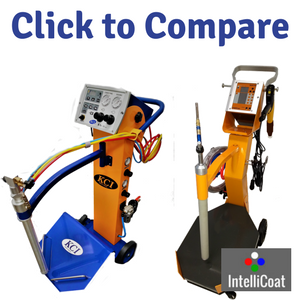 The IntelliCoat system uses a full LCD push-button control panel and the KCI gun uses a combination of digital and analog controls. The KCI Machine has Push button cleaning, the IntelliCoat does not. Please note that with either system you still have to manually clean the gun and pump between colors for best results so this one is not a deal breaker for most shops. The IntelliCoat machine can store powder recipes where the KCI cannot. So if you have repeat jobs coating the same part or more than one coater operating the same gun powder recipe storage can help make sure your finish results are consistent. If you’re a job shop and things are always changing, then that feature doesn’t really matter. The Price. The IntelliCoat is our own gun and is made for us by Colo in China. Because we control the entire manufacturing and distribution process…there is no middle man markup like there is with KCI. We ship directly to you from the factory and back you up with U.S. based support, service and parts if it’s ever needed.